A woman from Nagaland, India showing Naga\’s traditional weaving at EXPO 2005. Read ECOPLUS direct interactions with 15,000 visitors and the spotlight attention on the indigenous people from Alaska and India at EXPO 2005. For 45 days from mid March to end April 2005, ECOPLUS participated in the Global Village of EXPO 2005 held in Aichi, Japan. ECOPLUS participation in the EXPO started at the begining of the exhibition and was a \”top batter\” in one of the five mobile mini-pavilions at the Global Village. The mobile mini-pavilions rotated their positions around the Global Village every month. Units in the village\’s pavilions were co-hosted by NGOs and NPOs from Japan and overseas. 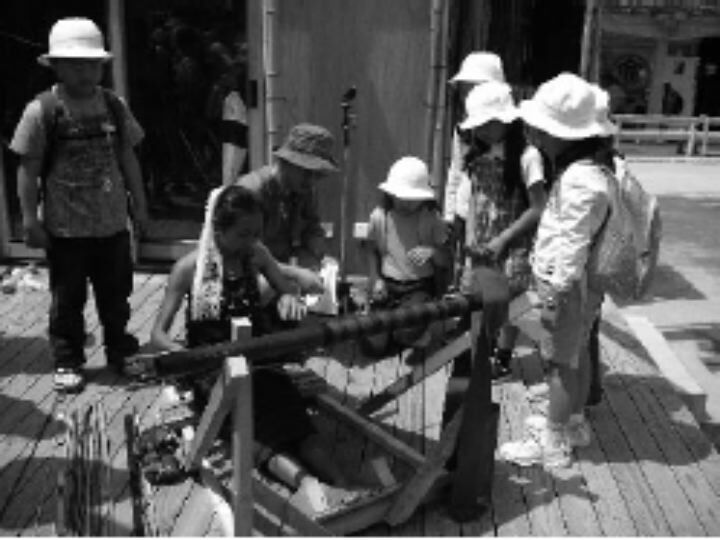 With the help of volunteers primarily from local Aichi Prefecture, ECOPLUS was able to have direct contact with approximately 15,000 people, conversing with them about nature experiences and environmental education activities, as well as recording \”Earth Messages for the future. Indigenous people – Yupik from Russian Mission, Alaska and Naga from Nagaland, a mountainous region in Northeast India – joined ECOPLUS\’ pavilion. The Yupik students and their teacher, Mike Hull, livened up the opening ceremony at the Global Village with their song & dance performances. Accompanied by music from round drums and slow rhythm singing, their dances, which articulate nature and their daily lives became a symbol of the Global Village. It even appeared on national television news. The Yupik students photography presentations on Yupik lifestyle and Mike Hulls talk on education and the environment in Alaska were also greeted with praises from fellow participants in the village. The group from Nagaland, Northeast India, which joined ECOPLUS in late April included youths from mountain villages situated at 1,500 meters above sea level and Amba Jamir from the Missing Link (an NGO which supports such mountain villagers). Though broadly referred to as Naga, each of these participants belongs to their own tribe, such as Ao. The women exhibited their traditional weaving skills, while the men exhibited crafts made from bamboo along side a showcase on Nagaland mountainous tribes farming method. Their traditional method of farming which involves burning and a cyclical slash as the only tool is carried out in accordance to, and in perfect harmony with, natures rhythm They use one plot of forest for two years and let it rest for the next 17 years. Units participated in the Global Village in April were unique in that they were involved in activities during the EXPOs preview, prior to the opening of the EXPO. However, things did not get off to a smooth start at the beginning. Seasonally, it was still cold enough for snow, the EXPO management was still in a trial and error phrase and the media focused coverage only on main attractions like the robots and mammoth, resulting in few visitors to the Global Village. The low number of 200 daily visitors at the beginning gradually increased to 500 towards the second half and soon volunteers were getting very busy attending to them. Over 40 ECOPLUS volunteers participated and helped out at ECOPLUS pavilion with YAMAZAKI Madoka participated for the entire EXPO as a live-in volunteer. Members of Tokai Bank\’s alumni group rotated to fill positions and made use of their communication skills acquired from various experiences. Many young volunteers took their hats off to one another and congratulated themselves for the experiences they have gained from participating in the exhibition. The hard disk of the computer hosting the special EXPO web site set up for ECOPLUS\’ participation in the Global Village of EXPO 2005, Aichi, crashed at the end of April. Incessant attempts to recover the hard disc by specialists in both Japan and USA were, unfortunately, met without any success. Due to serious damages to the surface of the disc, the specialists rendered the hard disk irrecoverable. Though ECOPLUS has replaced broken parts, restored the functions of the site and re-entered data that is replaceable, data from the nearly 300 messages left by visitors at the expo was not able to be recovered. We sincerely apologize for our inability to handling data properly.